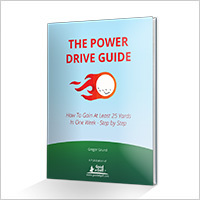 Subscribe and get The Power Drive Guide book, free updates, and email course. Use this guide to gain at least 25 yards off tee in one week. It reveals the five power steps that will improve your driving power and accuracy like clockwork. Best of all this e-book is FREE! You can get your copy by signing up for the FREE Good at Golf newsletter. “Seven Great Golf Tips – Simple Steps Towards a Better Game” is a compilation of seven of the best tips you might ever get to improve your game. Things like how to take your game from the range to the course and the three essential keys to shoot lower scores will help your game for sure. 120 Timeless Golf Lessons helps you to create plan to improve your game step-by-step. By working on all aspects of the game (short game, long game and mental game) you’ll be playing your best golf in just 30 days. Improve your game and uncover your true golf swing. Order your copy today on amazon or other good book stores.